Can I Convince You I Might Be a “Cult Leader”? I know this sounds like a dumb article I am going to write and it probably is. Nevertheless, I am going to write it simply because I need to assume the lowest common denominator for people who don’t personally know me. I am also writing because there is currently a “smear-and-shame” campaign going on against my friend, April Brown, charity auctioneer, to discredit her and her upcoming book “Poetic Justice”. One of the ways being attempted to discredit April is by telling strangers that April is my friend and by showing a picture of me and April IN THE SAME PICTURE with two other friends smiling, happy, and all dressed up! Ooooo… pretty nasty stuff, huh? Yes, I know, I would be a bit nauseous myself if I was friends with someone like me or was in a picture with someone like me! First off, did I ever publicly state I was a “cult leader”? I must confess I did state (titled myself) a “cult leader” on ExtortionLetterInfo.com (ELI). So there you go. Now if I told you that because I am this self-appointed “cult leader”, can I convince you that I have the ability to have women perform unlimited sexual favors for me, people give all their money and personal belongings to me, people worship at my feet, and people blindly follow whatever instructions I give them, and basically treat me as a religious figure as all good cult leaders do, would you believe me? What if I pleaded to you and swore my life on a stack of Bibles that I was a “cult leader”? Would that help me in convincing you? Probably not. I am assuming (but one never knows nowadays) that even if you have never met or heard of me, you might be hard pressed to actually believe that I am a “cult leader”, no matter how loudly I scream it out or how many paragraphs I write. The truth of the matter is that a true cult leader in today’s world especially in the U.S. is pretty rare and far-fetched. The only thing I can think of that comes close to true cultism are the FLDS polygamists. They really are freak shows and I feel sorry for the people in them but it is hard to rescue those that don’t want to be rescued but I digress. And yet, we have a few individuals who have try to sell the idea that I am a “cult leader” just because I (sarcastically and dark humorously) self-titled my role and position on ELI. 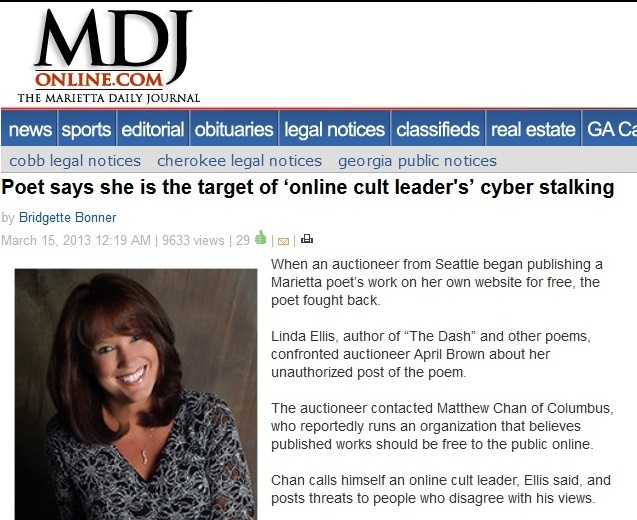 Linda Ellis: Dash Poet extraordinaire extortionist. Timothy B. McCormack: Infamous Girly lawyer for Getty Images and co-conspirator with the Dash Poet against me. 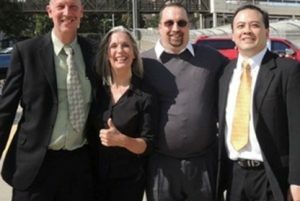 Elizabeth W. McBride: Columbus GA lawyer who tried to convince not one court but TWO courts including the Georgia Supreme Court I was a “cult leader”. 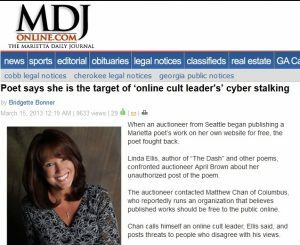 Bridgette Bonner of the Marietta Daily Journal: Yes, this so-called newspaper actually published I was an “online cult leader”. I never got a call from Bridgette Bonner or anyone from the Marietta Daily Journal who thought it might be a good idea to call to confirm that I, at least, sounded like a cult leader. Because the Dash Poet told Bridgette Bonner so, that automatically makes it true. I suppose it was because of the inspirational aura that was emanating from the Dash Poet that informed Bridgette Bonner that it was entirely true and did not require verification. Pulitzer Prize winning, the finest standard of journalism coming from Marietta, Georgia, they are most certainly not. P.S. For the record, I am open to receiving money and gifts from strangers. I am also okay with people worshiping at my feet and basically do anything I ask. I am good with people treating me as a religious figure. However, my girlfriend would probably frown upon my receiving sexual favors from other women, though. Sorry, I might have to turn that one down as tempting as it might be. Linda’s claim to be an inspiring author is as credible as her claim you are a cult leader and your friends and supporters are mindless followers. This most recent attack on my peaceful life is yet another example of her need to bury the truth about The Dash Extortion Scheme. Instead she flushed out 2 victims that want their story included in the book Poetic Justice. Please pass the kool-aid, I’m thirsty!